We’d love your help. 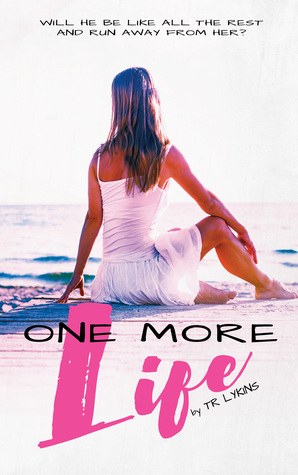 Let us know what’s wrong with this preview of One More Life by T.R. Lykins. Tyl Elizabeth Renee Watson never dreamt that she would ever be proposed to. To ask other readers questions about One More Life, please sign up. One More Life by T.R. Lykins, is the third book in her Last Heart Beat Series, and although it could be read as a stand alone, I suggest you read Book 1, The Last Heartbeat, and Book 2, The Life Gift, so you can really enjoy the whole series and understand better what is going on in this book 3, One More Life. Elizabeth Watson, from the time she was 16 years old, has had a hard time with her life; after finding out she had Leukemia, and was so sick and almost did not make it, all of her friends s One More Life by T.R. Lykins, is the third book in her Last Heart Beat Series, and although it could be read as a stand alone, I suggest you read Book 1, The Last Heartbeat, and Book 2, The Life Gift, so you can really enjoy the whole series and understand better what is going on in this book 3, One More Life. Elizabeth Watson, from the time she was 16 years old, has had a hard time with her life; after finding out she had Leukemia, and was so sick and almost did not make it, all of her friends slowly turned their backs on her, particularly her boyfriend, and that was the worst thing they could have done to her. However it made her stronger, and she did survive, and marched with her class at high school graduation. In college she met another nice boy, and unfortunately he did the same thing to her, when he found out about her being sick, with the possibility the Leukemia may come back, he was not willing to stick around and support her either. After graduation, she heads with her Mom and Dad for their annual summer vacation at the beach, just as they have done every year since she was a girl. This time though, things do not run their usual course, and after thinking about it, she decides to stay there at the beach, and get a teaching job, feeling that a change of scenery and living alone for the first time, it will be good for her. After telling her parents, they help her find a place to live and she is on her way home to get things ready to move when her first job as a teacher's aide is offered to her! That and working at a coffee shop part time will get her started. She is so happy to start a new chapter in her life and has high hopes for a change! At this time she also meets a very nice man, but she is afraid to hope, as all her experience with liking someone has turned out so bad. Beth is afraid to take the step even though she really likes this man. Beth does not want to put herself out there. Tyler Smith is a wonderful man and has wonderful friends, two of his best friends are married to wonderful women, and all of their situations have been unique to say the least as you will find out, or already know if you read the first two books, so not to spoil it for anyone, let's just say his friends are all wonderful giving loving friends, who have unique situations in their lives also, and have taken that step and are very happy and live each day to the fullest. One of the women also has made the ultimate sacrifice for her friends, something only a special person would ever do. When bringing his friend's son to school one day he sees Beth and he gets this funny feeling looking at her, and when his little nephew introduces them he gets a shock when they shake hands-and so does she! He is fascinated immediately! This has never happened to him before; it was a date or two and then on to the next person. He does not give Beth a chance to say no when he asks her out immediately! Beth, also feels different than before! Dare she hope? Beth is falling in love and so is Tyler. Then Beth gets a set back when she goes in for her checkup and things are a little off, she is afraid she is sick again. When going to get her blood work done she sees Tyler and he wants to know what is up. Beth just knows this is it, and what's more she feels mad at herself she did not tell Tyler from the beginning about the Leukemia. Beth just feels that he would not have stuck around if she had told him. What will happen when he finds out? Will he walk away from her? Will he stick around? Will Beth be disappointed again, will this be it for her? What Beth does not realize is that Tyler has been through all of this before with his friends, watching them go through terrible things and survive and come out stronger. This is what he wants for himself, a wonderful woman to spend his days with. Read this book and see what happens and if you have not read the first two, I strongly suggest you do! This is a beautiful series and the way the author writes these stories is very appealing and will cause you to feel all sorts of things-sadness, terror, happiness, hopelessness, it will hit you right in your heart! It did me. Have tissues ready! What is most amazing though is that something that happened years ago that was so horrifying and heartbreaking, also saved a lot of people's lives, and the coincidence of all these young people coming together is a really surprising - or is it? Find out and see what you think! This is the third book in the Last Heartbeat series. I would give it 3.5 stars. It's a sweet romance about a girl Elizabeth who had cancer as a teen, though it's gone into remission after a bone marrow transplant. Because of her illness her relationships with two guys, one high school, the other college, don't pan out. She finally meets her soulmate, Tyler, when she becomes a pre-school teacher for his friend's child. The writing is somewhat stilted and repetitive. Because the proposal scene is a This is the third book in the Last Heartbeat series. I would give it 3.5 stars. It's a sweet romance about a girl Elizabeth who had cancer as a teen, though it's gone into remission after a bone marrow transplant. Because of her illness her relationships with two guys, one high school, the other college, don't pan out. She finally meets her soulmate, Tyler, when she becomes a pre-school teacher for his friend's child. The writing is somewhat stilted and repetitive. Because the proposal scene is also the prologue as a flashback, the story is not a surprise. But the parts dealing with the sickness and transplant are interesting. Tyler was looking for his forever girl and would he find it in Elizabeth? She had been through so much in her life and all the guys she had met before were mister wrongs. This story is beautifully written and ties in perfectly with the other two books in this series. As always T R gives us a perfect man and a great woman!!!! Great book!!! A must read, I couldn't put it down!!!! Just started reading this book!! Fast, enjoyable read. Lykins books just get better and better! So glad Tyler finally found his forever girl! Loved loved loved this book! Please say it's not the last of this series! This is the third book in the Last Heartbeat series. It could be read as a stand alone, but you will recognise a few characters if you've read the first two books. This is a sweet new adult romance, continuing the theme of organ transplant and organ donation. I enjoyed the story and seeing how it fit in with the first two books in the series. As an avid reader who loves and reads most genres. The love of these books spiked my interest to learn more about the book world and the process it took to become an author. Learning as much as I can about the wonderful world of writing, I had to write my stories. I’ve had these stories building in my head for over a year and I just needed to share them with everyone. Educating myself in this indus As an avid reader who loves and reads most genres. The love of these books spiked my interest to learn more about the book world and the process it took to become an author. Learning as much as I can about the wonderful world of writing, I had to write my stories. I’ve had these stories building in my head for over a year and I just needed to share them with everyone.